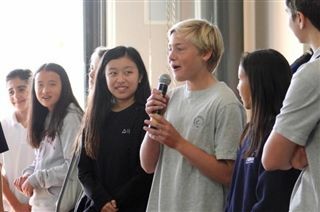 In a world of spell check and autocorrect technology, Pacific Ridge students demonstrated the value of old-fashioned brainpower during last week's Middle School Spelling Bee. The 21 finalists, who were selected as winners in their individual English classes, pulled from their reading and memorization strengths, as well as their phonetic and pattern-recognition skills to spell words such as garrulous, organelle, and gargantuan. In the end, 8th grader Shivam Desai, was the last student standing. His winning word? De rigueur. Shivam will go on to represent Pacific Ridge in the county-wide San Diego Spelling Bee in March.